ISS! The International Space Station! And a not-so-secret secret spy satellite. And there is a plane in the header image. And there are probably some birds in those trees. But that’s beside the point. I’ve been trying to get an ISS fly-over for some time but it never works out. My best shot was over the summer. I misread the time of the fly-over and had to bail just before it happened as the mosquitoes were literally killing me where I was at. I tried to get its silhouette transiting the sun but missed it (it was a 0.71-second transit so if ISS was off the slightly off the estimated time, I would miss it). Other times the weather has killed the chance. But not this time. ISS was going to be doing a seven-minute horizon to horizon (NW to SE), right over the top of the sky fly over just before dawn on Friday. The skies were clear. The moon set much earlier in the night/morning. It was also cold (about 47 with a good, constant breeze from the north). Being cold was important for reasons which will be discussed momentarily. I went out to the same spot I shot the Geminid Meteor Shower at last December. ISS would appear just above the NW horizon at 5:49 am. Due to light pollution, I would be shooting to the SE. I arrived just before 3:00 am so that I could shoot several hours of star trails while out in the dark. The cold dry air was perfect for shooting in. My test shots were coming out really crisp. I got everything set and got to shooting. The cold also makes batteries not last as long. After about 100 minutes, I did a very fast battery change (camera off to shooting again was maybe 20 seconds) just to make sure I had plenty of juice left when ISS came flying by. When the time came, I watch ISS pop-up above the horizon behind the camera. I was giddy like a child, jumping up and down in the cold, quietly cheering. It took about four minutes for it to cross the sky and get into frame. As it was just starting to fade into the pre-dawn white light on the SE horizon, my camera decided the battery was too low to continue shooting automatically. But I got the shot. Had I swapped batteries a minute or two earlier, I would not have. That was a close one. All in, I got 164 minutes, (297 frames) of star trails with the ISS fly-over. On the left side on the shot, there is another faint line cutting through the sky. It’s a satellite (I saw several satellites but they were too faint to cut through the star trails). After doing some research, I found out what satellite that is in my shot. It’s known as USA-234, but it’s real name is NROL-25 (which stands for National Reconnaissance Office Launch). It’s a spy satellite, but it probably doesn’t do too much spying anymore. Or that’s what they want us to think. These are various edits from the shoot. 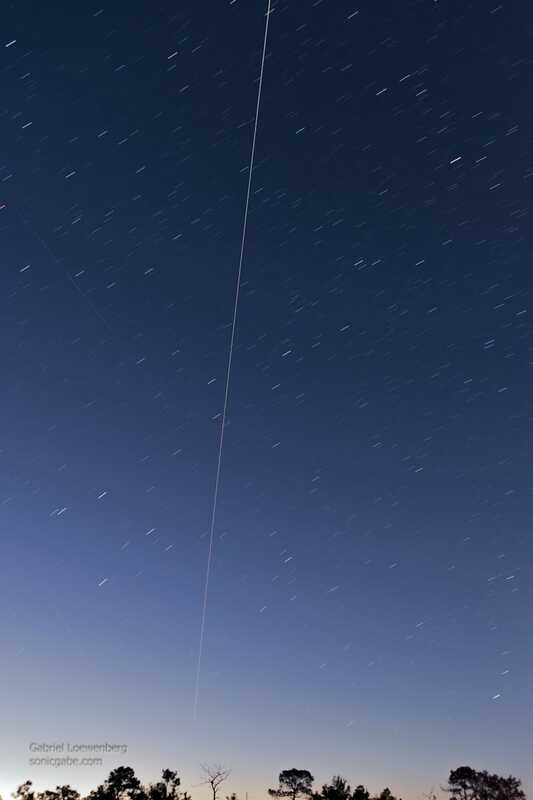 This is the ISS streak without the three minutes of star trails that are in the header pic. I also edited out the spy satellite. This is ISS, NROL-25, and 164 minutes of star trails. This is me doing that thing I’ve been doing with star trail pictures, getting all arty and stuff. Just for reference, this is the Geminids shot from last December that was taken at the same spot as these. There are some Leonid meteors in Friday’s picture, but they are really too faint to do anything with. There were several really amazing ones just out of frame. Oh well.